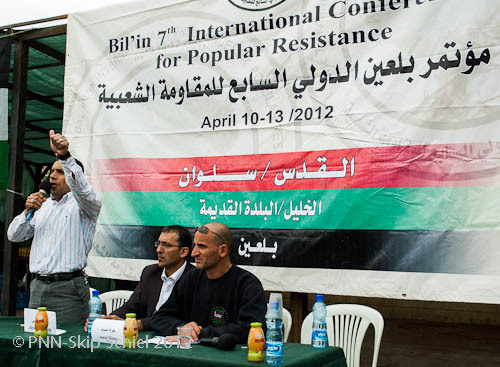 I finally reached today’s Bil’in conference site in the most ancient part of Jerusalem, Silwan and Bustan, home (as of November 2011) to 55,000 of Israeli Palestinians and 320 Israeli Jewish settlers. 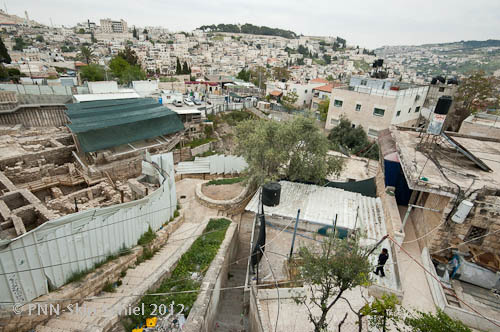 One might term this “Anxious Coexistence on the South Side.” Jews call this area, a steep hill south of the Old City, the City of David based on archeological evidence that during the time of King David some 3000 years ago this is where people lived and where he had a palace and lies buried. Up the hill is the Temple Mount as termed by Jews, or the Noble Sanctuary, Al-Haram al-Sharif, as named by Palestinians. The hill is steep. I know, I walked it, both ways. About 150 of us met in the open on what had been a playground now slated for demolition to be converted into a parking lot by Israeli authorities. 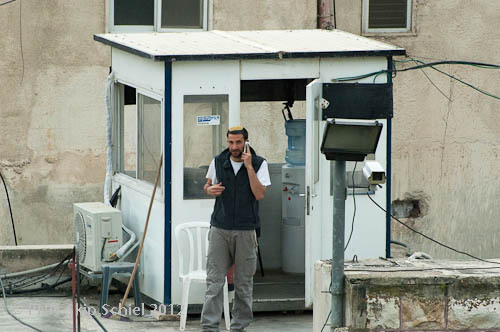 Most had been in Hebron the day before when the attendees were greeted by border police who, in collusion with settlers, beat, arrested and detained a sizeable number of them. 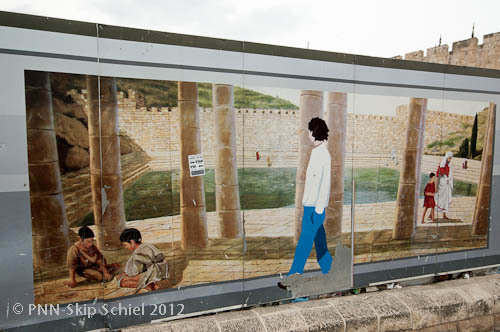 I did not worry that this might happen in Silwan. I confess I was eager for the fray, prepared for more conflict photography. 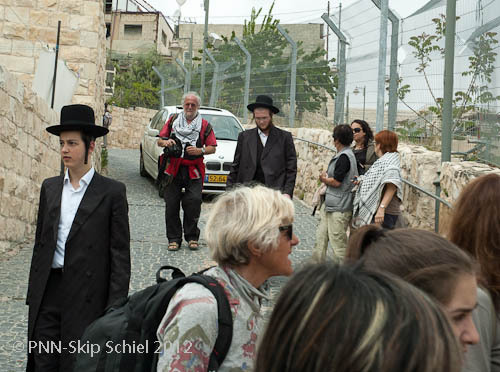 Interruption by a settler attempting to enter and video–blocked by a participant on crutches–was the only incident. I realize Hebron is the worst of the worst because of settlers, a particularly vicious brand of settler mentality—which some settlers might refer to as the best of the best, the true settlers. Forty of the conference participants were from Italy, a fact that might make M proud. When I spoke with an Italian translator and he asked, do you speak Italian? I answered, no, but my close friend M does. 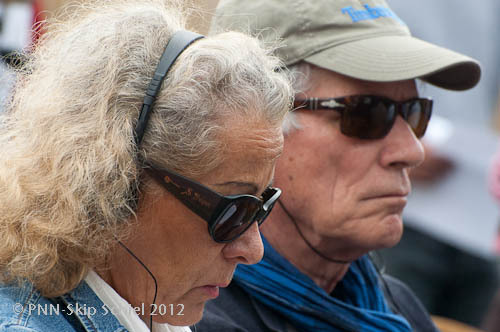 She is Italian American, lived for a few years in Italy (maybe it was only months and I exaggerate). The conference offered simultaneous translation so I could more or less follow the panel talks. Nearly all followed the same format: I live in X, the Israelis did Y, and we do Z. That is, in the case of al Walaja for example where I photographed last week, the Israelis have been insidiously confiscating land, and the Palestinians are steadfast in their resistance. 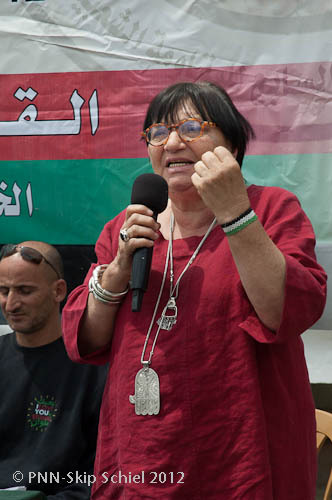 For me the most notable talk was by Luisa Morgantini, former Italian Deputy Speaker of the EU Parliament, one of the main international people behind the Bil’in Conference. Apparently one of the reasons so many Italians turned up. She said, we are ashamed of our governments, we are ashamed of our leaders, they talk but do nothing. We are tired of blah blah blah. We demand action. We responded with our heartiest applause. I do not intend to diminish the truth or power of the other statements. Each was in its own way moving. One built upon another, clearly establishing the facts on the ground, which in this case means relentless Israeli illegal and unjust theft of land and denial of basic human rights. Judging from the cacophony of languages spoken during the informal periods, I concluded there were very few compatriots from the USA. Why so few? I heard French, I heard the language of Luxembourg, I think I heard German, Swedish, and surely Italian. But very little American English. Also no Japanese who are often at resistance actions and very little media. Maybe a TV crew from Spain and one (I learned later) from Direct TV. 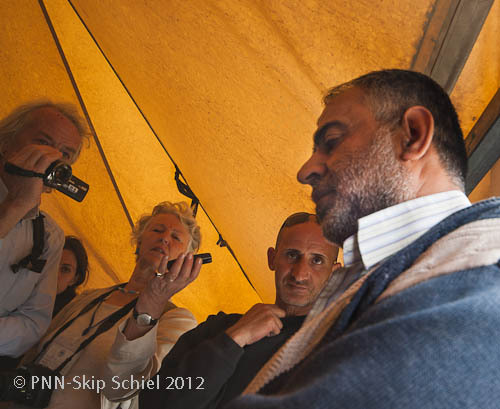 I represented PNN (Palestinian News Network). 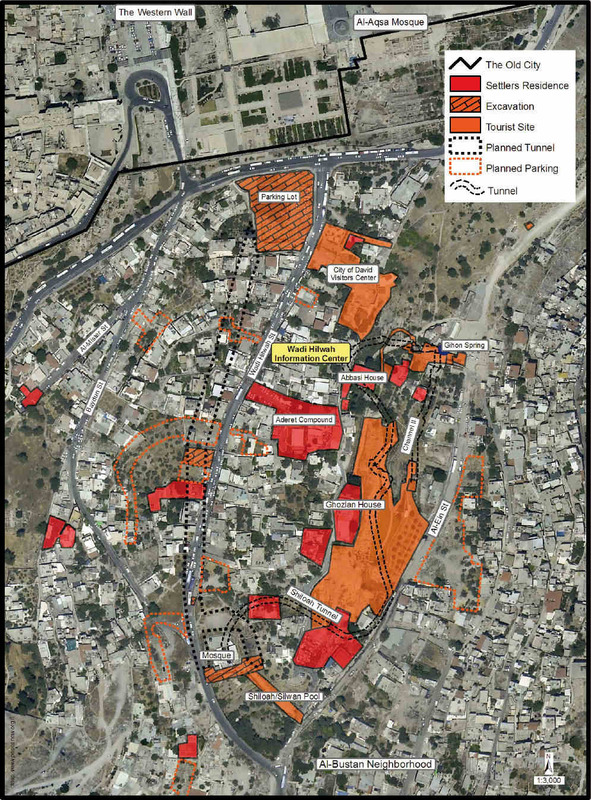 The gist of the message from those living in Silwan and Bustan is that settlers with the aid of a right-wing archeological group, Elad, use archeology, heavily laced with mythology, to attempt to justify land grabs. 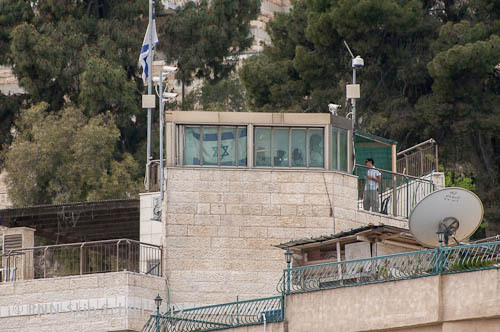 The settlements/colonies in this case are individual homes or clusters of homes, usually identifiable by Israeli flags and sometimes roof top patrols. 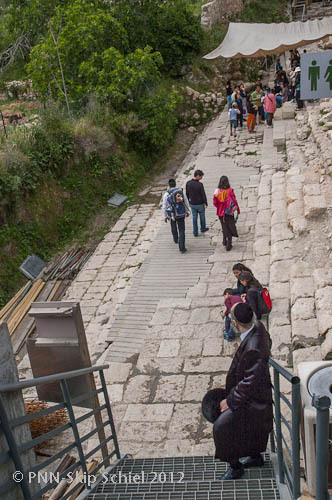 Israel built a special road that Israelis use for access to their homes and tourists use to explore the site. 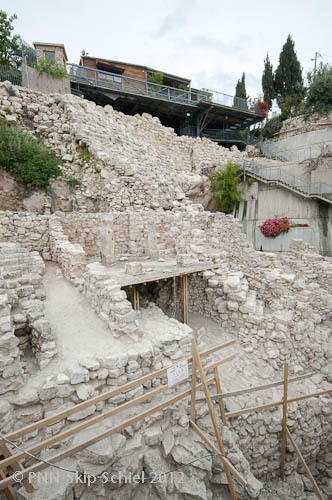 In addition, the government has established several archeological parks which I’ve explored in the past and expect to learn more about later in April when I tour with the alternative Israeli archeological group Emek Shaveh. After the talks we toured. Before the talks, I explored the Silwanic Center, also known as the Wadi Hilweh Information Center, a multi-room center of resistance to Israeli oppression in Silwan. 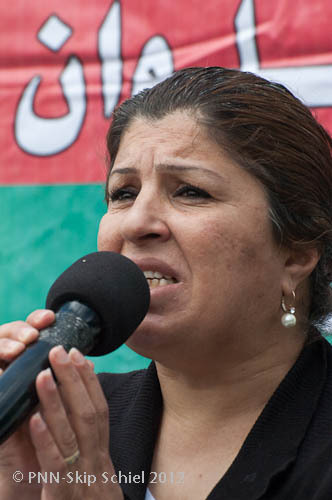 The Center is often threatened, leaders are many times arrested, the Center is sometimes forcibly closed. Susan R wrote me about being in Hebron the day before with the conference during the violence and was concerned about our safety. 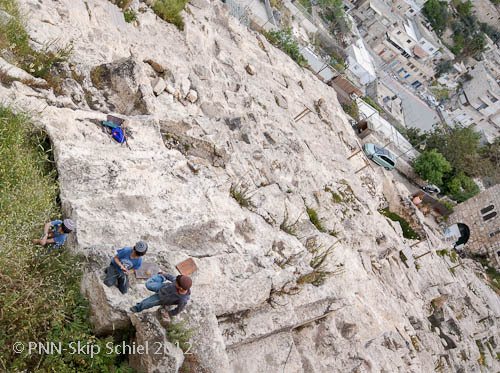 In Silwan, as mentioned, we had minimal problems. 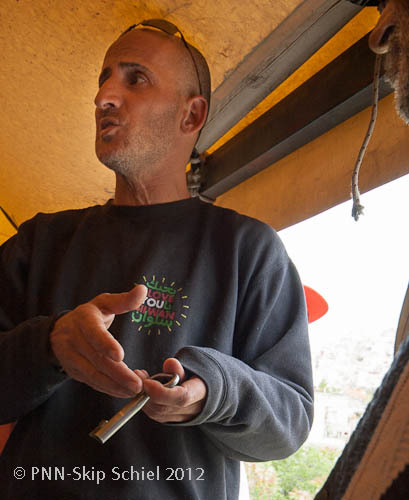 In fact, on the tour several Jewish Israelis with us called out to settlers, you have nothing to fear from us, and by the way what right do you have to be where you are? Or so I understood later because they spoke Hebrew. Returning to the Old City after the tour I listened in on a conversation between one of the conference participants from Luxembourg speaking with an Israeli woman who lived in Silwan. Arabs once owned your house. Yes, but we bought it from the owner. There have been many demolitions here. Yes, but no more. We live in peace and harmony with our neighbors. They like us. There is no trouble. Later the man and I noted how effectively the woman denied facts. 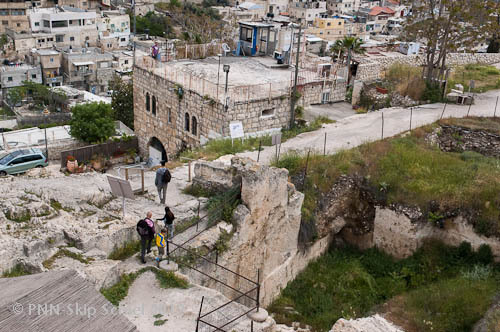 To live in places like Silwan I wonder if Israelis must master the power of positive denial. Impenetrable belief systems which smother any alternative views, especially ones that might be true. At the bottom of the hill, the legendary Pool of Siloam. (Wikipedia says, Siloam is an ancient Greek name derived from the ancient Hebrew name “Shiloah.” The Arabic name “Silwan” is also derived from Siloam). A visitor must now pay 22 or so NIS ($6) to enter, while a few years ago admission was free. And it is in the same condition as about 5 years ago. No further progress excavating the major extent of the pool where allegedly Christ restored the vision of a blind man by gathering some dust or dirt near the pool, spitting into it to make a putty, and placing it on the man’s eyes. The tour ended at the Bustan Community Center where we heard from a man who had, along with his sons, been many times imprisoned for resistance. 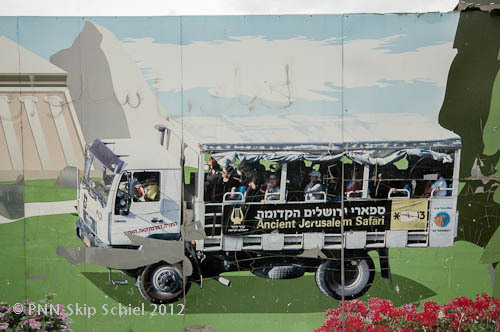 Most of the conferees boarded a large bus for transport back to Bil’in where I suppose they stayed with local families. I pondered my choices: snag a ride on the bus to some point up the high hill, ride a local bus to Damascus Gate, hail a private taxi, or walk. 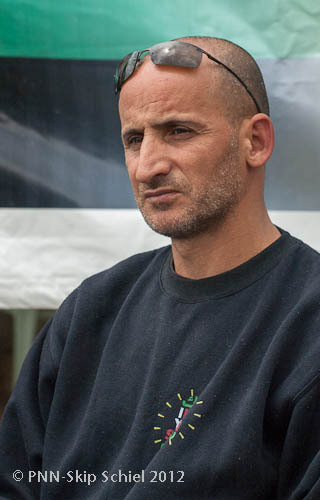 I met Bob with the Christian Peacemakers Team in Hebron. He and his partner decided to take the bus. I was tempted. I waited, chatted, the bus did not arrive. I thanked them for their advice and set off uphill to retrace our tour path. Glad I did: extra photos, the conversation with the local Jewish woman, a stroll thru the Old City crowded with locals and tourists, many of them from Ethiopia wearing white gowns and head scarves. I eventually emerged at the bus stop to board the #21 straight to Bethlehem and then the walk thru Bethlehem’s Old City, another bus, the old rinky-dink one, and finally home in Beit Sahour where I was famished and fatigued. Home never felt better. 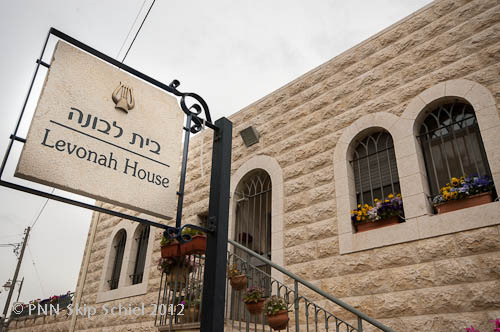 I look forward to next week’s Silwan tour with Emek Shavah.